There are few series that get me as excited as a new installment of Assassin's Creed does. From the intricate storytelling to some of the best original characters in video games today. I am always salivating at the chance to play more of these terrific games. Now that Revelations is here and I have already played through it's main story, I am hungry for more. But first I feel the game must be recognized for its successes and in some cases failures. The original Assassin's Creed was an ambitious game that stumbled often but still captured the attention of many gamers. AC 2 changed everything and gave us the polished experience we had wanted from the first game. Brotherhood gave us everything great about the second game as well as refined combat. So where does Revelations stand? Revelations innovates in a few ways. 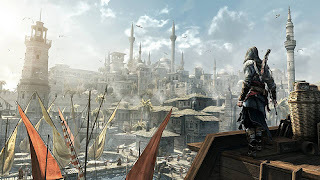 The addition of the hookblade allows for speedy travel across ziplines scattered throughout Constantinople as well as increased climbing speed. It also serves to be of some use in combat but it does not feel much different from the normal dual hidden blades. Then we have the new bombs. You can create and customize a wide variety of these bombs. Some are lethal, others are used as distractions, and some for obscuring you or your target. As nifty and great as these new features are they are very optional. While hookblade climbing will become a regular part of your play, ziplines and bombs are a mixed bag. Often I would find myself at the wrong end of a zipline, they never really seemed to be where I needed them. But when I did use them they were a blast and there is little more satisfying than a zipline assassination. As for bombs I forgot about them for the first half of the game. I had to force myself to start using them, and they can be a lot of fun but in the end they are just another tool in your vast arsenal. There is one other major addition to the core gameplay and that is den defence. If you are not careful at managing your notoriety in Constantinople your assassins dens can become under attack. In order to defend them you must take part in a tower defence style game. I understand that some people really enjoy tower defence games but it is just not for me. Den defence isn't entirely miserable though it was fun at some points but figuring it out as a newcomer to the genre was a bit daunting. However I did start to get the hang of it, but it is not something that I am eager to do any more than necessary. Later in the game you can prevent these attacks by placing master assassins in your dens to keep them safe, but keeping an eye on your notoriety will do the trick as well. Much like Brotherhood you can send your assassin recruits on missions outside of Constantinople. In addition to giving your assassins experience you can also gain partial control over these cities and gain money and items. There is even an achievement for having simultaneous control over all the cities. This was one of my favorite diversions in Brotherhood and I look forward to continuing it in Revelations. Another returning feature from Brotherhood is the shop renovations. It works essentially the same but you now gain notoriety when you renovate a shop. Aside from those changes the core mechanics of the series are still in place. However there are some new elements to the story. In Revelations you will primarily be playing as Ezio but there are also several missions for both Altair and Desmond. 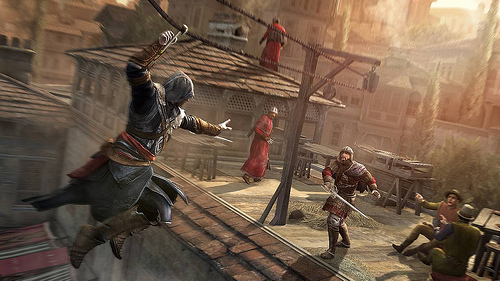 The Altair missions span from before and after the events of the original Assassin's Creed. I don't want to spoil anything but there is some neat gameplay with him as well as some eye opening insight into his life and family. Desmond's gameplay is something else altogether. After the events of Brotherhood, Desmond was forced back into the animus to ensure that the bleeding effect would not harm him. While not able to communicate with the real world he remains conscious inside the Animus and in order for him to make it out he must face his past and follow Ezio on his final mission. Desmond's missions take place within the Animus and thus offer some very surreal visuals. The game switches to a first person view where you have two different block shapes that you can spawn and use to climb, jump and fall your way out of these mazes. At first, I did not think I was going to care for these missions but they quickly became a highlight for me. These missions provide a look into Desmond's past on 'the farm' and his time as a bartender in New York City. Now for the main course. 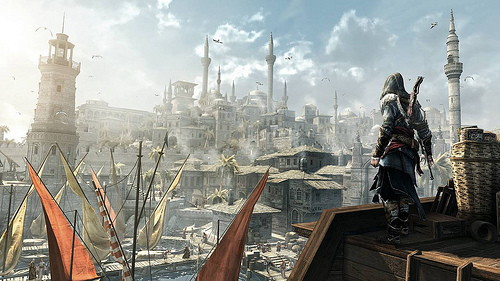 In his fifties, Ezio is on a mission to Masyaf to uncover secrets hidden by long ago by Altair. He eventually makes his way to a locked door requiring five special keys. His search for these keys leads him to Constantinople (not Istanbul). Along the way he makes some new friends, most important a woman named Sofia. Sofia and Ezio develop a bit of a romance but he fears getting close to her will drag her into the invisible war with templars. Their relationship is very sweet and innocent and had me going "awwww". It is a nice change from the womanizing Ezio of past. Aside from this, Ezio's story stumbles a bit. From running around the city and finding keys there is not much else going on in the first half of the game. The main bad guy, if you can call him that isn't even that menacing. I hate using the word 'epic' but AC 2 and Brotherhood really had that grand feeling and Revelations just falls flat in that regard. However, the last few memory sequences definitely pick things up a bit and offer a couple of twists. 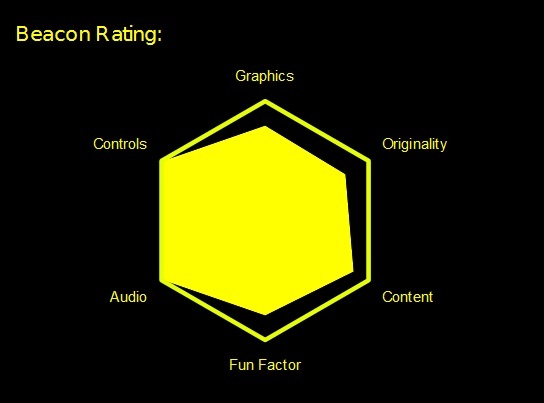 It is just not up to the high standards I have come to expect from the Assassin's Creed series. As for the ending, well you will just have to play for yourself to find out about that. Although I will say that I still have a lot of questions lingering from the ending in Brotherhood. And it is disappointing considering the writers had said they planned to tie up loose ends from previous games. Which they do to an extent. Just missed a few of the big ones. Regardless of all of that, the character development of Ezio is top notch and I firmly believe that he is one of the most well developed characters in all of video games. If you can I would highly recommend watching the short film Assassin's Creed: Embers once you finish Revelations. It follows the events of revelations by about a decade and provides even more character development for Ezio. The final seconds will have you quivering, it is quite beautiful. Brotherhood introduced an innovative multiplayer mode to the series and now Revelations is taking it to the next step. 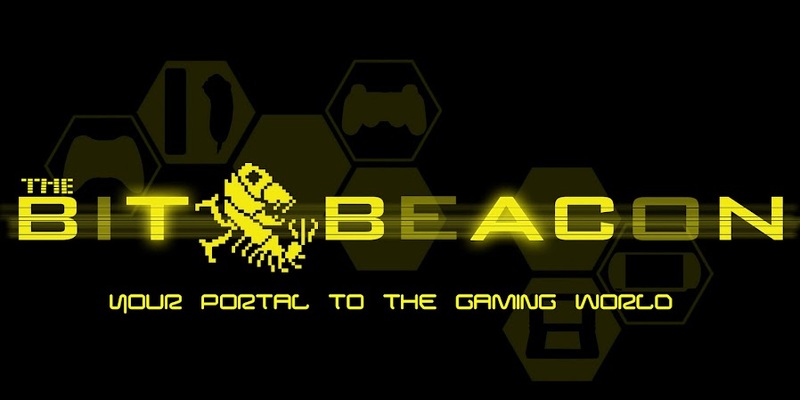 Featuring new game modes, characters and mechanics the multiplayer is back in a big way. But most importantly, for Assassin's Creed fans, there is new story content focusing on the Templars. Now there is real motivation to climb the ranks as each time you level up in the multiplayer you will unlock special files for reading as well as video content. All in all, Revelations is another solid entry into the series. If you are a fan I can't recommend the game anymore. If you are new to the series I wouldn't recommend jumping in here, ideally you should start with the original or even AC 2, but Revelations still does a good job of recapping previous events. I do worry a little bit about the future of the series. Another installment of Assassin's Creed has already been confirmed for next year, and with Ezio and Altair's stories now over it is time for a new protagonist. I can only hope that Ubisoft takes the time to really develop someone special like Ezio. 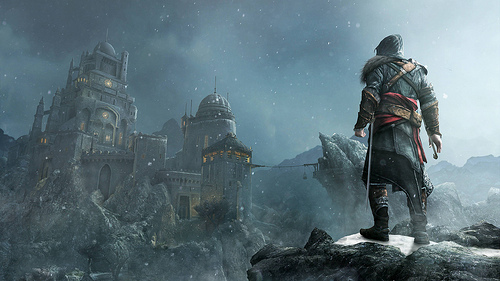 Assassin's Creed Revelations is available now on PS3 and Xbox 360 and coming soon to PC.